The idea of embodied hope sounds like it might have come from a well-meaning self-help book, or even a religious treatise. In fact, the Scots drummer now based in Birmingham found it in a book about jazz improvisation called The Fierce Urgency of Now, by the wholly academic-sounding team of Fischlin, Heble & Lipsitz. 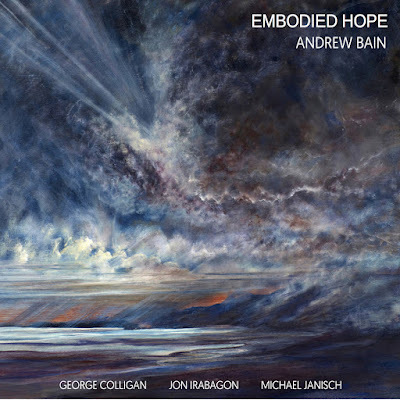 If the music on this album has its roots in academic research (even more so because the book is just one of many Andrew Bain has been reading as part of his current PhD studies at the Royal Birmingham Conservatoire), you wouldn’t necessarily jump to that conclusion from listening to it. that's a tribute to the way in which it not only embodies hopes, then, but also brings a potentially dry concept to luscious life. Bain is always a vital driver behind the kit, ever engaged and urging his fellow players on. Not that these players need any urging. George Colligan is on piano, Jon Irabagon on tenor saxophone and Michael Janisch on double bass. They all go back a way in different contexts, but those personal ties and mutual experiences are vital to the band leader and immediately apparent in the recording, which was made near the end of an 11-date UK tour in November 2016. The track titles of the suite come from the seven aspects of Embodied Hope as detailed in that book: Accompaniment, Hope, Practice, Responsibility, Surprise, Listening, Trust. And, yep, you can tick them all off - Bain, Colligan, Irabagon and Janisch exhibit them all, and then some. The music is steeped in the modern jazz language, but also, at times, has some of the spiritual searching of Coltrane about it, at others some Latin flavour, and as a composer Bain brings a strong melodic sense to his tunes. The playing has the solid foundations one should expect from musicians who are comfortable in the classroom, but also has the natural exuberance that only comes with considerable time spent on the bandstand. A rewarding listen that gives a bit more every time I press Play.